VIDEO | Pre-Commencement: What are you going to wear to graduation? 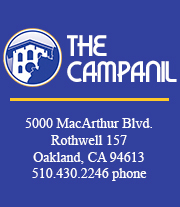 The Campanil conducted woman-on-the-street interviews with various graduating students on the day before the 123rd Mills College Commencement. We went to find out what they’re going to wear to graduation AND what they would wear if their parents/family weren’t coming to the ceremony. Suffice to say, we’ve received many amusing answers. Check out the photos we’ve taken yesterday of the interviewees. Interviews by Tymeesa Rutledge. Filmed and edited by Melodie Miu.